To his fans, Elvis Presley’s death was certainly a tragedy. The cause of his death was neither violent nor particularly unusual; it was the loss of his immense talent at the young age of 42 that made his death a tragic one. The Internet Movie Database (IMDb) recognized that by giving Presley a place on its list of 177 “Tragic Deaths” among film industry celebrities. The only qualification for making the list seems to be an unexpected death, or, in more romantic terms, dying before one’s time. Some on the list died in childhood, while others lived into their fifties. The cause of death could be anything, just as long as it kept the performer from living a full life span. In addition to Presley, the IMDb list of tragic deaths includes four others who had prominent roles in one of his movies and four more who had other well known connections to Elvis. The actor, most known for his role as Johnny Yuma on the TV Western The Rebel, first met Elvis on the set of Love Me Tender in 1956. For the remainder of that year, Adams was a frequent visitor at Elvis’s Hollywood hotel suite and at Graceland in Memphis. He even accompanied Presley on personal appearances, including his Tupelo homecoming in September and his record-breaking appearance in Dallas in October. 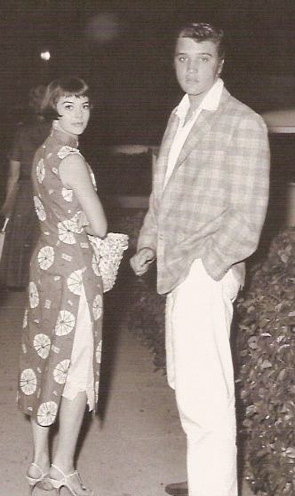 Adams also introduced Elvis to Natalie Wood, who would later earn her own spot on the IMDb tragic deaths list. In January 1968, Adams’s dwindling acting career took another hit when a film in which he was set to appear was cancelled in Rome. A demoralized Adams returned to his Beverly Hills home, where he was found dead, slumped against a wall on the night of February 7, 1968. An autopsy revealed that he had enough sedatives and other drugs in his body “to cause instant unconsciousness.” The death certificate listed drug “intoxication” as the immediate cause of death, with an added notation reading “accident; suicide; undetermined.” Nick Adams was buried in Berwick, Pennsylvania. He was 36 years old. In 1957 Carolyn Jones was nominated for an Academy Award for her role in The Bachelor. 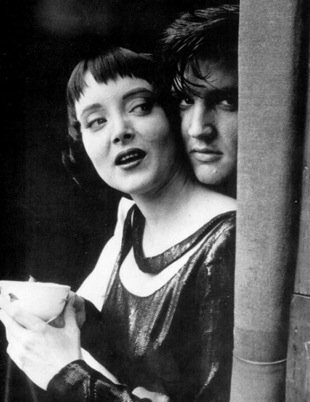 She followed that up in 1958 with a critically acclaimed performance opposite Elvis Presley in King Creole. In the role of Ronnie, an ill-fated mobster moll, Jones, then 28, displayed a sexuality that Hollywood failed to exploit in her future roles. After working in various films for six years, she got the part for which she is best known, that of Morticia in the TV comedy The Addams Family. When the show was cancelled two years later, Jones found acting jobs difficult to find for a decade. According to his IMDb biography, Andy Kaufman, “took comedy and performance art to the edges of irrationality and blurred the dividing line between reality and imagination.” So much so, in fact, that when he died, many people that it was just another gag. Best known for his role of Latka Gravas on the TV comedy Taxi, Kaufman was a big Elvis fan. It’s been said that he checked ahead when traveling to see if an Elvis movie would be playing on TV in a town he was scheduled to visit. If so, he packed a TV set in his car so that he could be sure to see the movie. During the 1979 Johnny Cash Christmas special, Kaufman performed "That's When Your Heartaches Begin" in Elvis style. It’s been claimed that of all the Elvis impersonations at the time, his was Elvis’s favorite. In 1983, Kaufman was diagnosed with Large Cell Carcinoma, a rare and deadly form of lung cancer. With the disease already in advanced stages, treatment could not halt its rapid spread. 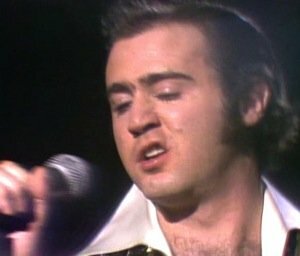 On May 16, 1984, Andy Kaufman died at the age of 35. He is buried in Beth David Cemetery in Elmot, New York. Jenny Maxwell is best remembered for playing the spoiled Ellie Corbett in the 1961 Elvis movie Blue Hawaii. As the only rebellious member of a group of teenage girls on vacation in Hawaii, Maxwell’s character was eventually brought to her senses when Elvis gave her a spanking on the beach. Although Maxwell was only 19 during the filming of Blue Hawaii, she had already been married and divorced, and was the mother of a three-year old son. Her acting career never took off after Blue Hawaii. She appeared in just two more films and a few TV shows before ending her career in 1963. In 1970 Maxwell married attorney Ervin Roeder, who was 21 years her senior. On June 10, 1981, both of them were shot and killed during an apparent botched robbery in the lobby of their Beverly Hills condominium. Jenny Maxwell was 39 years old. Her ashes were scattered at sea. 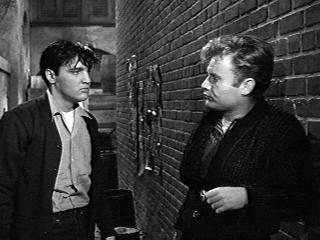 Vic Morrow’s film debut was as a tough street punk in Blackboard Jungle, the 1955 film that featured “Rock Around the Clock” by Bill Haley and the Comets. As Shark, Morrow played a similar young hood in 1958’s King Creole. Shark drew Danny Fisher, Presley’s character, into the seedy New Orleans underworld of crime. Danny’s struggle for redemption culminated in a knife fight with Shark in a New Orleans alley. In 1962 Morrow got the role for which he is most known, that of Sgt. Chip Saunders in the TV series Combat! When the show was cancelled in 1967, Morrow’s career took a down turn. Most of his film roles came in “B” features and made-for-TV movies. In the early morning hours of July 23, 1982, Morrow and two Vietnamese child actors were killed when a helicopter crashed on top of them during filming of The Twilight Zone: The Movie at Indian Dunes Park, a few miles north of Los Angles. Planned explosions forced the helicopter down into the Santa Clara River, which the three actors were crossing. When the helicopter tipped over, its main blade decapitated Morrow. He was 51 years old. His grave is in Hillside Memorial Park in Culver City, California. Kris Kristofferson once said, “If Elvis was the King of Rock ’n’ roll, in 1957 Ricky Nelson was the crown prince.” Legend has it that Nelson had no ambition to be a rock singer until a girlfriend told him she liked Elvis’s records. Ricky then declared he was going to make a record too. 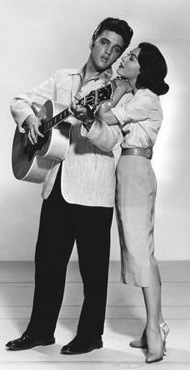 “I’m Walkin’, which he sang on “The Ozzie and Harriet Show” on April 10, 1957, launched his recording career. On September 29, 1957, the 17-year-old Nelson saw Elvis’s controversial show at the Pan Pacific Auditorium in Los Angeles. After the show, Ricky attended a party in Presley's private suite in the Beverly Wilshire Hotel. The two spent over a half hour talking privately in a corner of the room. 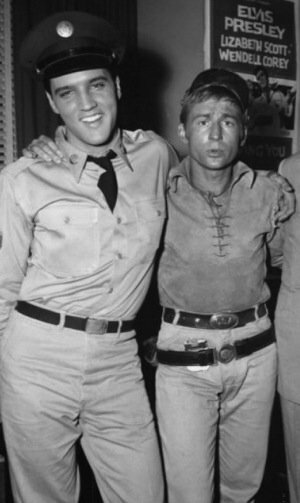 Although Elvis and Ricky never met again, they had connections through shared backup musicians. 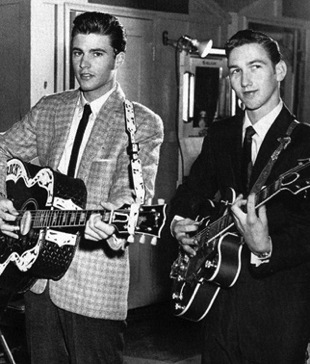 James Burton made a name for himself playing lead guitar for Nelson in the fifties and sixties before filling the same role for Presley in the seventies. The Jordanaires sang studio backup for both singers in the fifties and sixties. Scotty Moore also recorded with both singers. On New Year’s Eve in 1985, Nelson and his band were traveling on a private DC-3 aircraft from Alabama to Dallas for a concert that evening. The plane crashed in a field near DeKalb, Texas, and burst into flames, killing Nelson and his musicians. Ricky Nelson was 45 years old. Colonel Parker attended his funeral on January 6, 1986. Ricky Nelson was buried near his parents’ graves in Forest Lawn Memorial Park in Hollywood Hills. His gravestone carries his birth name, Eric Hilliard Nelson. “Discovered” on the New York stage in 1956, Judy Tyler landed a MGM contract and moved to Los Angles to work in films. She considered her second role, that of Elvis Presley’s leading lady in 1957’s Jailhouse Rock, to be her breakout opportunity in Hollywood. Just a few days after filming was complete, though, Tyler and her husband were driving home to New York when they were involved in an automobile accident in Wyoming. On July 3, 1957, three miles north of Rock River on U.S. Route 30, they hit another car head on. On November 29, 1981, Wood was sailing on a yacht with her husband, Robert Wagner, and a friend, actor Christopher Walken. Somehow she fell into the ocean and drowned. Natalie Wood was 43 years old. She was interred at Westwood Memorial Park in Los Angeles. "To his fans, Elvis Presley’s death was certainly a tragedy. The cause of his death was neither violent nor particularly unusual; it was the loss of his immense talent at the young age of 42 that made his death a tragic one."